This post was sponsored by JustFab. If you’re a mom, you know what it’s like to always be on the run. Taking your child to practice, or the doctor, or to a play date, or to anything that gets you moving fast on the way out of the house. But, just because you’re on the go doesn’t mean that you have to settle for an old, stained t-shirt and over-washed jeans. Who said moms can’t rock a stylish look? JustFab gives you the fabulous, fashionable style you want and need at an affordable price, even when you’re handling your kids at your busiest moments. Are you a “mommy-to-be,” or are you just in the beginning stages of being a parent? If so, you’re going to need a lot of storage for all those diapers, bottles, toys, and anything else to make sure your little one is happy while on the go. Now available on the JustFab site is the versatile and trendy Ebby Diaper Bag, which comes in either Black or Taupe. 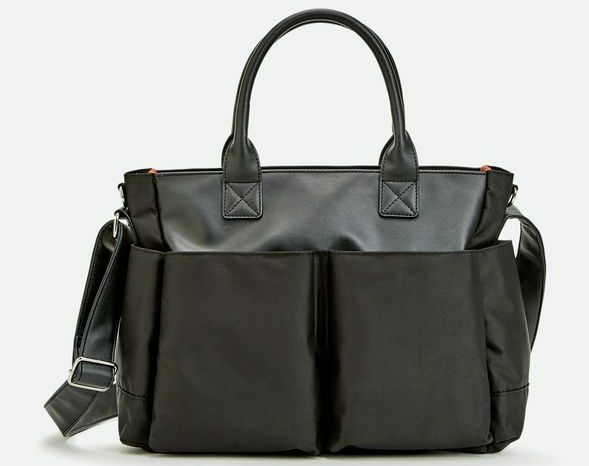 This faux leather bag is simple, elegant looking, and functional, making you look stylish in conjunction with working hard. 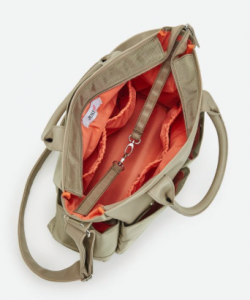 This bag comes with five exterior and four interior pockets to store all your necessities, and it is built sturdy, meaning you can hold your baby’s items without the fear of the bag breaking! The Ebby Diaper Bag is priced at $69.95, but with the VIP membership, you can grab the bag at $49.95. If you want to become a VIP member and get exclusive deals, all you have to do is take a quiz. Then, you’ll get a personalized boutique. You shop, sign up and then you’re a VIP who saves some money! Becoming a VIP will also save you money on another motherly accessory. If you’d rather not hold on to a bulky diaper bag, then a great alternative is the Ace in Ace bag. 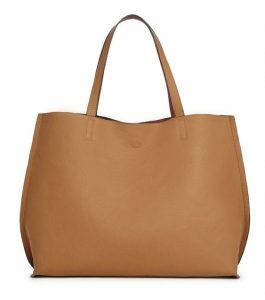 This sleek tote comes in multiple colors, and is even reversible. There’s an adjustable shoulder strap to make you comfortable, and the faux leather material will make it easy for you to wipe off spilled milk or whatever other mess your little one has made. With the VIP membership, the price is $39.95, and without it, it’s still an affordable $49.00. JustFab has all the fashionable, affordable accessories and clothing you will be sure to love. With their in-house design team, they will make sure they find the best suit for you on your journey to make a fashion statement, or even for a date night without the kids. Say “goodbye” to your old baby bag and “hello” to the sleekest, most stylish and versatile bag!